Our clinic offers one of the few certified veterinary acupuncturist in the state. Dr. Billingsley has been certified in veterinary acupuncture for many years now. She has quite a following of patients who swear by her ability to move their chi. When your pet is in pain, so are you, and that is why West Flamingo Animal Hospital provides safe, pain-relieving acupuncture and laser therapy for your pet. 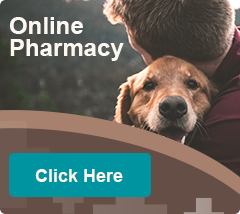 These techniques may help your pet with problems such as paralysis, noninfectious inflammation (such as allergies), arthritis, musculoskeletal problems, gastrointestinal problems, and bodily aches and pain. When your pet is in pain, we will be there to provide relief. Our clinic offers one of the few veterinary acupuncturists in the state of Nevada. We have been experts in veterinary acupuncture for many years. 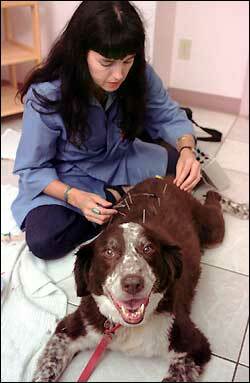 Acupuncture has relieved countless animals of chronic pains, allergies, arthritis, and other bodily issues. Our Class 4 therapeutic laser therapy is the cutting edge of medical therapy. 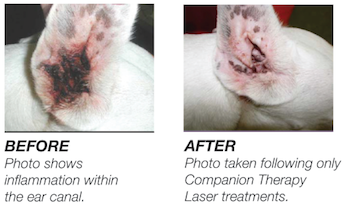 Laser application is minimally invasive and is often administered in the presence of the pet owner. Laser therapy has shown to be effective in a variety of conditions, including but not limited to improving arthritis pain, increasing wound healing, reducing post-op pain and even healing damaged neurologic tissue.